Bellator 161: Kongo vs Johnson (photos) » MMA H.E.A.T. It took 15 minutes of heavyweight action during the main event of “Bellator 161: Kongo vs. Johnson” to decide a winner between Cheick Kongo (25-10-2) and Tony Johnson (10-3), but in the end, it was “The Darkness” who emerged victorious via majority decision on Friday night. 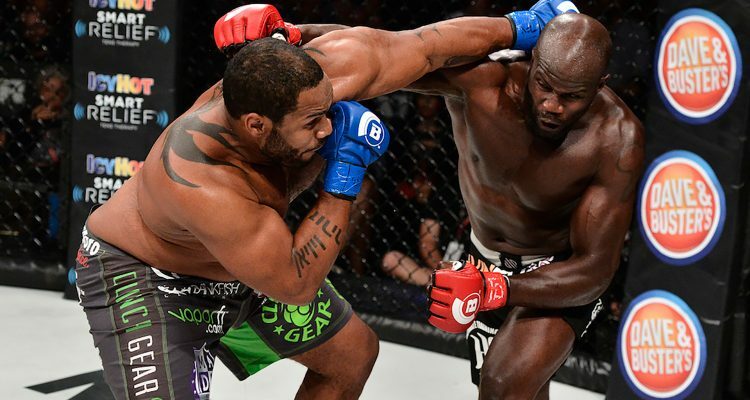 The action between the two sluggers varied between heavy punches and elite wrestling, but the grappling of Kongo won out, as the 41-year-old got the better part of the action in the final ten minutes and began his newly signed extension with Bellator MMA on a high note. The heavyweight title picture remains unclear, but if one thing’s certain, it’s that Kongo will have a claim to the strap when the promotion decides to put the title back on the line. Joe Warren (14-5) and Sirwan Kakai (12-5) traded blows for over ten minutes of heart pounding action in the evening’s co-main event, but it was Warren who finished on top after delivering a neck crank submission just 1:04 into the third round. After the win, the self-proclaimed “Baddest Man on the Planet” is now tied for second all-time in Bellator MMA victories with 12. The former two-division champion Warren has now won seven of his last nine contests and has once again proven why he belongs among the division’s elite. The loss marks the first time over Kakai’s eight-year career that he has been finished by an opponent. In a highly-anticipated women’s flyweight battle, undefeated Russian Anastasia Yankova (4-0) came out on top against Veta Arteaga (2-1) via split decision. With the win the 25-year-old Yankova continued along her brisk path to stardom with a comeback performance that two out of three cage side judges saw in her favor. Yankova impressed in her first ever fight in the US, recording her fourth career victory and second with the Scott Coker-led promotion. The win is the first to go the distance for Yankova, with each of her initial three coming by way of submission. For Arteaga, the difficult judges’ decision leaves her with the first loss of her professional career. During the opening contest at “Bellator 161: Kongo vs. Johnson,” Texas’ own Derek Campos (17-6) scored a come-from-behind unanimous decision (29-28 x3) win over Dutch knockout artist Djamil Chan (12-3). After absorbing a devastating blow that sent him to the canvas early in the opening round of action, “The Stallion” quickly recovered and responded in a big way in rounds two and three. The 28-year-old Campos scored his second straight win and sixth since joining the Bellator MMA fray. For Chan, the loss ends an impressive run of seven consecutive victories over a dominant four-year stretch. No Comments on "Bellator 161: Kongo vs Johnson (photos)"